ab130275 recognizes the Influenza Hemagglutinin epitope (YPYDVPDYA). The antibody recognizes HA epitopes located in the middle of protein sequences as well as at the N- or C-terminus. 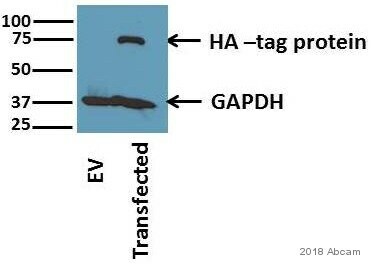 Synthetic peptide corresponding to HA tag. Our Abpromise guarantee covers the use of ab130275 in the following tested applications. Immunocytochemistry/ Immunofluorescence staining of ab130275 on methanol fixed CHO cells transfected with an HA-tagged protein at 1 µg/ml. Cells were then incubated with Alexa Fluor® 594 Goat anti-mouse IgG secondary and were counterstained with DAPI (blue). 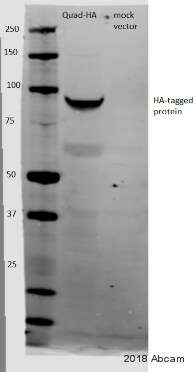 Western blot of Anti-HA tag antibody [16B12] (ab130275). Lane 1: Molecular weight marker; Lane 2: Recombinant Posi-Tag Epitope Tag Protein; Lane 3: HA.11 overexpressing cell lysate; Lane 4: Untransfected cell lysate. 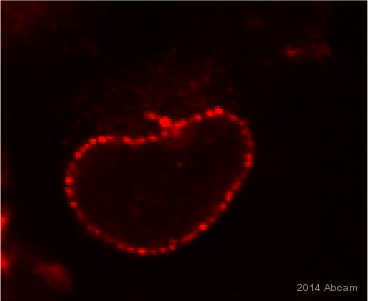 ab130275, at 1/1000 dilution, staining HA tag in Porcine aortic endothelial (PAE) cells expressing Human dopamine transporter tagged with HA by Immunofluorescence. Publishing research using ab130275? Please let us know so that we can cite the reference in this datasheet.